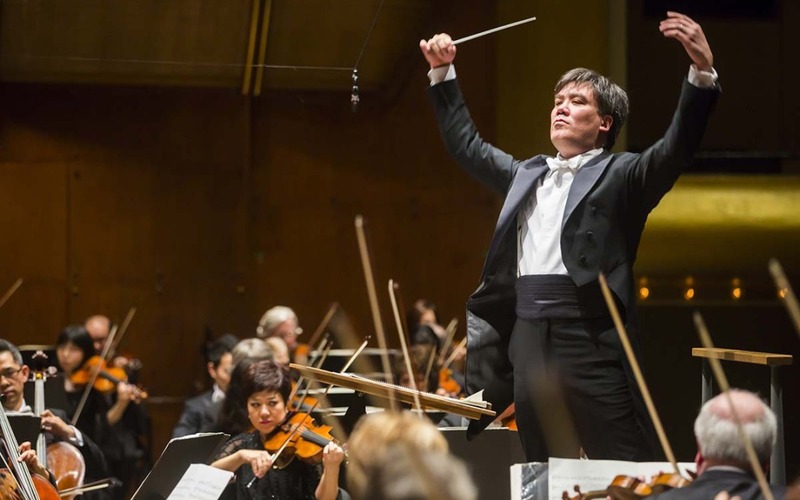 In seven years as Music Director of the New York Philharmonic, Alan Gilbert has continued to evolve the role of the modern orchestra; as the New York Times put it, “helping to change the template for what an American orchestra can be.” The eighth and final season of Gilbert’s tenure, which also marks the Philharmonic’s 175th anniversary season, not only honors their shared hometown, but also celebrates this extraordinary legacy. Thus world premieres of new Philharmonic commissions rub shoulders with iconic masterworks and an adventurous opera performance; artistic residencies continue to forge and nurture meaningful musical partnerships; innovative programming explores the ways music can foster global community and positive change; and the conductor and orchestra once again take their vision overseas on their seventh and final European tour together. Meanwhile, as a perennially popular guest of the world’s foremost ensembles, Gilbert returns to the podiums of the Berlin Philharmonic, Munich Philharmonic, Leipzig Gewandhaus Orchestra, Orchestra of the Lucerne Festival Academy, and Rome’s Accademia Nazionale di Santa Cecilia, besides making his staged operatic debut at La Scala. Once again, the season looks to showcase the “unflashy radicalism” with which the conductor has consistently shown himself to be “a force of permanent revolution” (New York magazine). This position, together with The Marie-Josée Kravis Composer-in-Residence, was one of the initiatives launched by Gilbert in his inaugural season as Music Director. It was also he who subsequently introduced the Kravis Emerging Composer and Artist-in-Association positions, and all four partnerships continue to flourish. In the coming season, the second of Esa-Pekka Salonen’s term as Composer-in-Residence, Gilbert conducts the New York premiere of the great Finn’s Cello Concerto, a Philharmonic co-commission, with Yo-Yo Ma (March 15–18), who rejoins Gilbert and the orchestra to reprise the concerto on their EUROPE / SPRING 2017 tour (March 23–April 7). To celebrate these partnerships, the Music Director also leads the New York premieres of Salonen’s Wing on Wing and Aeriality by Kravis Emerging Composer Anna Thorvaldsdottir alongside Kavakos’s account of the Brahms Violin Concerto (May 19, 20 & 23). Other artists of note who will appear with the orchestra under his direction this season include violinist Lisa Batiashvili, Philharmonic Principal Clarinet Anthony McGill, pianists Stephen Hough and Lang Lang, mezzo-soprano Joyce DiDonato, and 2015-16 Artist-in-Residence bass-baritone Eric Owens. Together with soprano Renée Fleming, pianist Yefim Bronfman, and violinists Joshua Bell, Pamela Frank and Philharmonic Concertmaster Frank Huang, Ax and Batiashvili are among the artistic luminaries who come together for a festive program to celebrate Gilbert’s 50th birthday, under his own leadership (Feb 23). Other highlights of the conductor’s Philharmonic season further illustrate the breadth of programming that has consistently characterized his directorship. Key concerts include complete performances of Wagner’s Das Rheingold, with Eric Owens and Jamie Barton heading a star-studded cast (June 1, 3 & 6); a tribute to new septuagenarian John Adams, with whose Doctor Atomic the Music Director scored his first Grammy Award (March 9–11); a creative pairing of Beethoven’s Ninth with Schoenberg’s A Survivor from Warsaw (May 3–6 & 9); seasonal performances of Handel’sMessiah, in which Gilbert’s “decisive phrasing, generally brisk pacing and insistence on crystalline textures” previously impressed the New York Times as “magical” (Dec 13–17); and accounts of Mahler’s Fourth Symphony on both sides of the Atlantic, to complete his full Philharmonic cycle of the composer’s symphonies (March 1–4; March 23–April 7). The upcoming “EUROPE / SPRING 2017” tour takes Gilbert and the orchestra back to Luxembourg, Antwerp, Düsseldorf, Essen, Budapest, Vienna, Hamburg, and Copenhagen, crowned by their third residency at London’s Barbican, in repertoire showcasing such season highlights as Salonen’s Cello Concerto, Mahler’s Fourth, and the music of John Adams (March 23–April 7). Making a fitting end to the 2016-17 season and indeed to the Music Director’s eight-year tenure, their Season Finale program features “guest artists from around the world in performances that highlight important international issues and foster the idea of a global community that shares a common humanity.” (June 8–10). Gilbert remains in high demand with the world’s foremost orchestras. At Milan’s La Scala, he helps premiere a new production of Porgy and Bess by stage director Philipp Harnoncourt, starring Morris Robinson and Kristin Lewis, which marks the conductor’s first staged opera with the company and the first time that the original version of Gershwin’s score will be heard there in its entirety (Nov 13–23). As a regular guest of the Berlin Philharmonic, Gilbert leads a program of Tchaikovsky, Bartók, and John Adams, the orchestra’s current composer-in-residence (Dec 2–4). After joining violinist Anne-Sophie Mutter for a program exploring the roots of Modernism at the Lucerne Festival(Sep 4), Gilbert returns to the Leipzig Gewandhaus Orchestra with a pairing of Bartók’s Bluebeard’s Castle and Beethoven’s Second Piano Concerto, followed by a special “talk and performance” event for which he and soloist Inon Barnatan – the Israeli pianist now launching his third and final season as the New York Philharmonic’s inauguralArtist-in-Association – join German TV personality Malte Arkona (Oct 20–22). In the New Year, the conductor resumes the podiums of the Munich Philharmonic (Feb 2–5), Royal Concertgebouw (Feb 8–11), and Accademia Nazionale di Santa Cecilia (Feb 16–18) orchestras, where highlights include the world premiere of a new Concertgebouw commission by Joey Roukens, and a Rome rendition of The Ring Synthesis, Gilbert’s own arrangement of selections from Wagner’s Ring Cycle. In addition to his Emmy nomination, Gilbert’s achievements were recognized with two new awards. He received anhonorary doctorate from Westminster Choir College, where he served as the 2016 commencement speaker, and was named an Officier de l’Ordre des Arts et des Lettres by the French government. As the subject of an episode of PBS TV’s celebrated Charlie Rose show, he eloquently described his vision for the evolution of the orchestra in contemporary society and his own plans for the future. Click here to see Gilbert’s appearance on Charlie Rose. See the original news release at 21C Media Group here.